Sustainable development - GDA - Gesamtverband der Aluminiumindustrie e.V. It has always been worthwhile economically to use aluminium in a closed loop comprising metal extraction, processing, use and recovery. The major advantage of the metal is its unlimited recyclability. 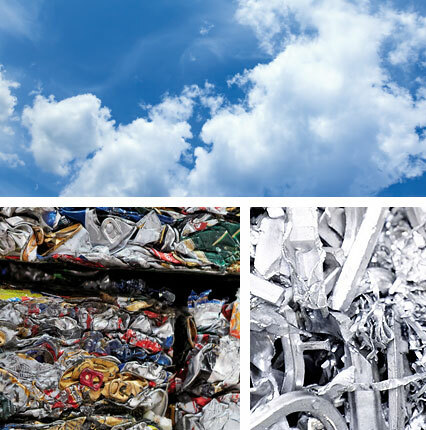 For example, scrap profiles or used aluminium sheet and foil can be used to make new profiles, new rolled products or even other high-quality products. high recycling rates by reducing waste and emissions. In addition to the recycling loops for the product itself, the aluminium industry also recycles operating and auxiliary materials, such as the core sand used to make the moulds required for the sand casting of engine blocks and cylinder heads, the lubricants used to roll semi-fabricated products, solvent residues from foil lacquering processes and the caustic soda used in the production of aluminium oxide. The salts used in the recycling process to tie up any contamination adhering to the scrap are another example: they are recovered as well. This minimises any interference in the ecosystem and encourages sustainability. Measures to protect the environment are adopted along the whole value-added chain from bauxite mining through to recycling, and including aluminium extraction and processing. Collection and utilisation of used aluminium products for the manufacture of new products.